A number of US companies have rolled out plans recently on expanding their business in China in 2017. Experts noted that this is due to China's economic transformation as well as common interests shared by the two countries. Experts also noted that the Chinese government has done a lot to improve its business environment, although challenges still remain for overseas companies. The growing interest US companies have in the Chinese market arrives at a time when Chinese President Xi Jinping is meeting US President Donald Trump in Florida. William Zarit, chairman of the American Chamber of Commerce in China (AmCham China), told the Global Times on Friday that the meeting "will be an excellent opportunity for the two leaders to get to know each other and discuss, in a relaxed atmosphere, some of the major issues facing the bilateral relationship and the world." In March, a number of US companies from various sectors beefed up efforts to enlarge the scale of their business in China. For example, on March 22, US hospitality service provider Airbnb Inc launched a new travel platform in China and revealed ambitions to double its investment in the country in 2017. The company also plans to increase its Chinese staff to 180 by the end of 2017, up from about 60, the company told the Global Times on Wednesday. US beverage maker Coca-Cola told the Global Times on March 29 that the company will open two new plants in China in about three months. It also hopes to increase its sales volume in China by more than seven times in about 10 years. US logistics company UPS also announced in late-March that it would enlarge their rail service between Europe and China. The company told the Global Times on Wednesday that it is planning to upgrade its services in a number of Chinese cities this year. US retailer Wal-Mart Stores Inc announced plans that it would open 15 new stores in Central China's Hubei Province over the next three years, providing 6,000 jobs, according to a statement Wal-Mart sent to the Global Times on March 30. 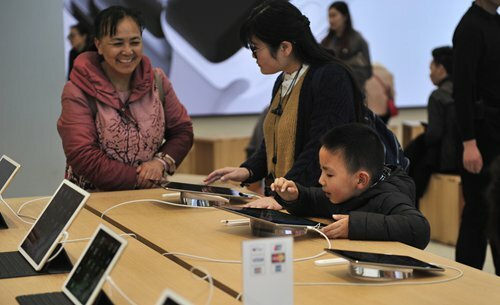 US companies' rising passion for the Chinese market grew after they saw business improve in China in the past year. According to a report published by AmCham China in mid-March, out of 462 companies interviewed, 58 percent said that their business performance improved in 2016 compared with the previous year, up from 55 percent in 2015, while 16 percent said their business deteriorated, compared with 23 percent in the previous year. Only 5 percent of them forecast that their business will have negative growth in China this year, it said. Investment from the US in China increased by 55.4 percent year-on-year in the first 11 months of 2016, the Ministry of Commerce noted in January. Sang Baichuan, director of the Institute of International Business at the University of International Business and Economics, told the Global Times on Wednesday that China's economic transformation and structural update has brought about growing market demands and enhanced consumption ability. This has made China a favorable business destination for many US companies, which are market-oriented. But challenges also remain. According to the AmCham China report, US companies still face a number of difficulties in doing business in China, including unclear laws, rising labor costs and protectionism. Tu Xinquan, deputy dean at the China Institute for WTO Studies at the Beijing-based University of International Business and Economics, said it is undeniable that China's economic system is not mature enough and that it takes time to improve the situation. "However we should note that the Chinese government has been making efforts to tackle the problem by strengthening opening up," he told the Global Times Wednesday. Tu noted that China and the US are "looking in the same direction," which has laid the foundation for economic cooperation between the two countries. AmCham China chairman Zarit noted that when [AmCham China] met with senior Trump administration officials in February, it was clear that they were very familiar with the issues faced by US companies in China, "perhaps more so than previous administrations."